"This is magic in your mouth! Thanks for bringing it to the party Butch! Delicious with tortilla chips or served atop grilled chicken, pork, or mild white fish such as tilapia." 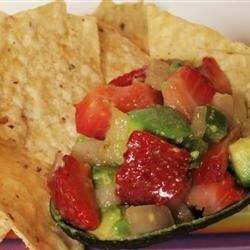 In a serving bowl, lightly mix together the strawberries, avocado, red onion, jalapeno pepper, cilantro, lime juice, and black pepper. Serve immediately. Make a festive, flavorful chip dip that always brings you good luck! Tasty, but not amazing. If you make it, I would recommend using less lime juice, it's all I could really taste. This was good not great. Substituted yellow bell pepper for jalapeno. It was lovely, transformed some rather fishy baked perch fillets into a lovely and colorful meal. will be making it again! I made this exactly as written and served it over 1 lb swai. I wouldn't change a thing!